This is probably the CLOSEST Copycat to Olive Garden’s Five Cheese Ziti al Forno! And NO canned alfredo sauce here! This is a super EASY Ziti al Forno Recipe and I’ve also included alternatives to some of the cheeses! Olive Garden’s five-cheese ziti alforno can now be replicated from home, folks! This recipe was born yesterday, literally… I made breadsticks along with this and do I have KEEPERS here. I have tried replicating Olive gardens breadsticks before but they just didn’t taste like Olive Gardens. Yesterday I decided to combine a mixture of recipes (in where my Italian loaves recipe, crusty pizza dough, a recipe from a mennonite cookbook were among the mix…) After the addition of an egg and adjusting some things a breadstick recipe was born– THE BEST Breadsticks from all the ones I have ever made! They turned out chewy and just amazing! Make them with this and see for yourself! This ziti version is really easy to make and NO Baking is required, just some broiling (which I used my little toaster oven for.) And you don’t even need to do that, just add the additional cheeses to the sauce (Olive Gardens buy one take one were microwavable and no baking was required.) 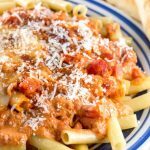 Besides I think baking done noodles gives the potential to dry out the noodles so why go through the extra steps… This sauce is so good you can make it just for dipping bread in and even if you’ve never had their al forno dish, this is a great pasta dinner to add to your rotation–A MUST TRY! 1. Cook pasta according to box instructions; drain, rinse with cold water and coat with 2 tbsp of olive oil. Set aside. 2. In a medium sauce pan combine the marinara sauce, heavy cream, tomatoes and sugar. Bring to a simmer and add the cheeses. Stir until bubbly and remove from heat. 3. Place pasta onto a serving dish and ladle sauce over the top center. Sprinkle with additional shredded mozzarella and parmesan cheese and broil just until cheese forms brown spotting. Garnish with addition parmesan cheese before serving. This is probably the CLOSEST Copycat to Olive Garden's Five Cheese Ziti al Forno! And NO canned alfredo sauce here! This is a super EASY Ziti al Forno Recipe and I've also included alternatives to some of the cheeses! Olive Garden's five-cheese ziti alforno can now be replicated from home, folks! Cook pasta according to box instructions; drain, rinse with cold water and coat with 2 tbsp of olive oil. Set aside. In a medium sauce pan combine the marinara sauce, heavy cream, tomatoes and sugar. Bring to a simmer and add the cheeses. Stir until bubbly and remove from heat. Place pasta onto a serving dish and ladle sauce over the top center. Sprinkle with additional shredded mozzarella and parmesan cheese and broil just until cheese forms brown spotting. Garnish with addition parmesan cheese before serving.